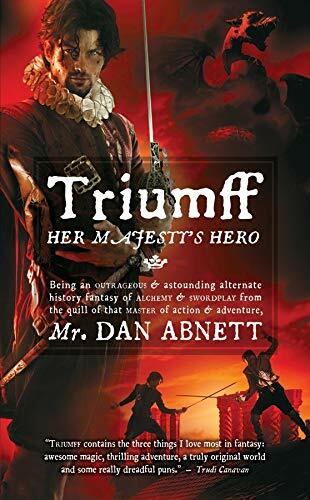 As you might expect from a swashbuckling Elizabethan fanhtasy set in 2010,Triumff gets a great deal of its fun from the humour this entails: references to the modern day. (Though some of the puns this involves are groan-worthy). Though Triumff is amusing, it's also a fun read in itself: mostly for the titular character. Sir Rupert Triumff, though not as distinctive a hero as some, is great fun to read - especially when forced to become an exceedingly amateurish spy. The constraints placed on him by the plot force his character into unusual situations, which of course makes it all the more amusing. One disappointment was his companionship - several characters introduced early in the novel could have played far larger roles than they did. I'd have liked to see more of the 'noble savage' - in actuality a member of a far more advanced civilisation - brought back by Triumff. Though all of these characters had a few significant scenes, the cast seems to skip almost from the protagonist, Triumff, to tertiary characters - and a stronger secondary figure or two would have improved the read. While unusual and varied, Triumff rarely manages riotous. It's a novel which, while a fun and entertaining read, fails to go quite far enough to distinguish itself: it's amusing, but not as over the top as Rankin, adventurous, but fails to match - say - Butcher, and historically-based, but doesn't do anything amazingly unique with the era. Triumff is an entertaining, light read if you want an afternoon off - but don't expect it to dominate your thoughts. ok, so maybe it isn't a perfect book, but it does sound fun! A perfect in-between book for all those super heavy brain-frying books.